Cool, clean, cute: ICE. 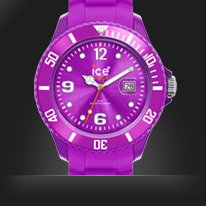 Ice watches are simple, silicone, and stylish. I apologize for all the alliteration but these watches really have got me amped. I have a watch: it’s black, metallic, Kenneth Cole, but it doesn’t particularly stand out. However, it is functional, as watches are. I suppose that is another often overlooked point; not only are watches fashionable, but they conveniently tell you the time. Now, instead of having to dig in your purse or pocket to whip out your cell phone to check the time, you can easily look at the nice accessory on your wrist known as a watch. I hope they haven’t lost their practical value since cell phones have rapidly replaced them. Now that you’re convinced that life without a watch is meaningless – and that a cell phone is not a watch – allow me to demonstrate why an ice watch is the hottest new thing to grab. While working, I complimented a customer whose watch seriously stood out (prior to being introduced to Ice watches) was one with a studded faceplate and braided-texture silicone band akin to an ice watch. Similarly, a week later I read an article in Neurology Now featuring Cindy McCain, John McCain’s wife, sporting a similar item in white. I was given a purple one to review. That’s the beauty of these ice watches: they come in such a variety of colors that they can be easily matched or mixed up. While I’m bland and prefer black, nothing stopped my mother from “borrowing” my watch and receiving some praise about it, too. Even if my fancy customer and Cindy McCain might have worn different brands than Ice Watch, only this brand has so many different colors, from plain white with different faceplates to a plethora of band colors to match the season (check out their new winter line!). Buy them and wear them like skittles, or have only one that makes you stand out every day. For more info, check out www.ice-watch.com. My video is coming soon! !